I’m participating in The Kitchen Cure for the next two weeks. I’ll track my progress here, and in this flickr set of before and after photos. 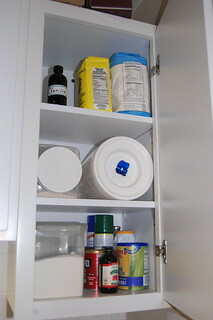 Today’s assignment was to declutter and clean the pantry and any other areas where canned and dry goods are stored. Since I hadn’t finished yesterday’s assignment, I started there and tackled the fridge. I pulled all the food out, and then started taking out shelves and drawers. 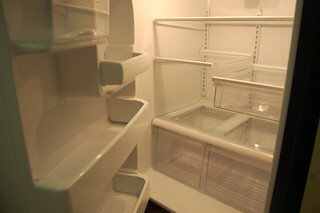 I did manage to get out the crisper that I thought would be stuck, as it turns out that bottom entire shelf comes out. I pulled up the shelf, drawer still attached, rotated it and was able to pull the drawer out before removing the shelf itself from the fridge. I mixed up some all purpose cleaner in a bowl and grabbed a fresh sponge, and got to work. It didn’t take too long to clean everything and get it back in, and it looked so clean and fresh I just had to take a picture. After a break for dinner, I moved on to today’s assignment. I gave myself an hour to get as far as I could, and I got through two cabinets. Again, not too much to get rid of, but everything came out and was considered. In my baking cabinet, I tossed some very old rye flour and moved my sugar into that canister, which will hopefully hold an entire 4 pound bag of sugar, as opposed to just most of a bag. The stuff in the other cabinet was in pretty good shape. Tomorrow I’ll pick up here and work on the rest of the areas where I store food. < Previous Kitchen Cure – What is this, anyway?